Stefan Bauer gained a reputation as an excellent instrumentalist, and as an interesting conceptualist and composer. His seven CD’s to date bear witness to his flexibility and his productivity (with Adam Nussbaum, Barry Romberg, Bernie Senensky, Charlie Mariano, Chris Bacas, Christoph Haberer, Claudio Puntin, Howard Levy, Kenny Wheeler, Laurent Roy, Marcio Doctor, Matthias Nadolny, Michal Cohen, Mick Goodrick, Paul McCandless, Ramesh Shotham, Rick Shadrach Lazar, Ted Poor, Thomas Alkier, Tim Hagans. Tim Wells, Volker Heinze, Jim Vivian, Ugonna Okegwo). Aside from travelling his native Germany annually with his own ensembles, he had opportunities to tour Africa, India, and West and Eastern Europe. Festival appearances from Abidjan to Zürich, and during the Olympics in Seoul/South Korea in 1988. In 2006 he formed his international 5-piece ensemble Voyage for a festival appearance at the Moers Festival/Germany, subsequent tours of Germany and at the Jazzkaar Festival in Tallinn/Estonia. In 2007 he performed as a guest soloist and composer with the WDR Big Band (Radio Cologne) directed by Vince Mendoza, and again in April of 2010 (arranged and conducted by Ansgar Striepens, a live TV broadcast/concert at the Cologne Philharmonic Hall). Stefan’s encounters with musicians everywhere remain a source of great inspiration. Rooted in Jazz, his compositions are informed by his European heritage and by encounters with musicians in Africa, India and North-America. In 1990 he received a jazz-compositions prize from Monaco, and the cultural award of the city of Dortmund/Germany, in 1997 his CD "Best of two worlds" was nominated for a JUNO Award (the Canadian Grammy). 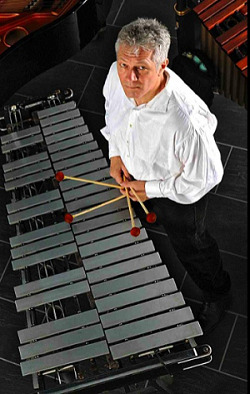 Besides his work as an active performer he has been teaching piano, composition, theory and vibraphone for the past three decades at a variety of schools in Germany and Canada, and in New York. Currently he teaches vibes, jazz theory and Orff Early Music at the Brooklyn-Queens Connservatory. Stefan Bauer regards the balance of playing, writing and teaching music as the ideal platform to share his knowledge of and his love for music with others. Stefan Bauer & David Friedman play "Two minds, one thought"